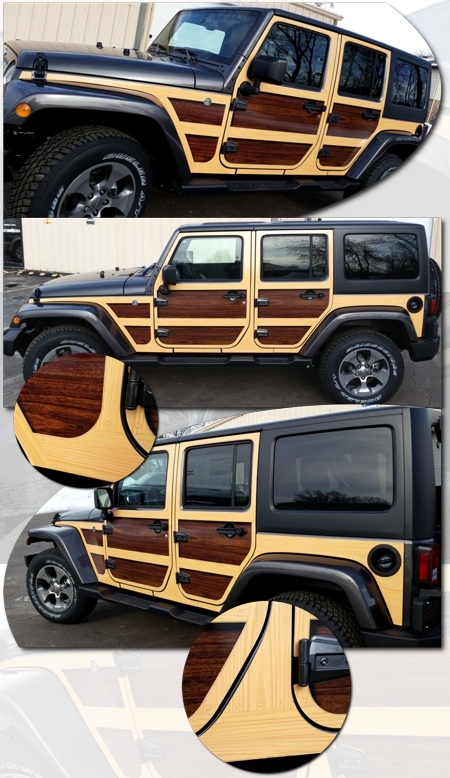 Set you and your Jeep Wrangler Unlimited apart from the rest with this attractive and magnificent Wood Panel Graphic kit. The unique three dimensional Fir and Cherry Oak wood grain graphic is captured in this high-definition digital print. Digitally printed with our DuraCOLOR graphic technology, kit is manufactured with premium automotive grade vinyl film materials. As a further step, graphic is covered with a 2 mil clear laminate which provides protection from miles of abuse. Our kit is precut and set for installation at and within the vehicle's distinct body lines and door panels. Pieces are contour cut and all openings are removed for ease of application - NO TRIMMING or CUTTING required! In fact, seasoned installers should be able to apply this kit within 2-3 hours. Kit provided with easy-to-follow general online installation instructions, detailed Parts List and graphic care guide. Kit is specifically fit for the '07-'17 Jeep Wrangler Unlimited and will not fit any other vehicle. Kit is offered in optional Air Release Wrap Film at additional cost (Wet Method application NOT suggested). Due to sheer size of various kit pieces, professional installation assistance may be required. Rear Gate is NOT included with kit but offered as an option (ATD-JEEPWRGLRGRPH30).